After last's week's Indian Summer vibe, I feel that autumn has arrived. There is a real chill in the morning air and my toes and their fading tan have been covered up with woolly tights and socks. As much as it saddens me to say goodbye to the warmer months, I love autumn. The beautiful colours of the changing leaves, bright blue skies on sunny days and starting to wrap up. It's this time that I start changing from light bright summer scents to a warmer spicer fragrance too. l'absolu for her by Narciso Rodriguez (£39/30ml House of Fraser) is the perfect autumnal aroma for me. I love Narciso Rodriguez other frangrances, in particular Narciso (see post here) which I wore daily last summer. All of his fragrances are bottled simply, elegantly and beautifully. All coloured internally, you don't get the half-used look, so they always look brand new and as if full of an opaque fluid, with the burgundy of l'absolu looking gorgeous for this season. More importantly, the enticing fragrance from within containing jasmine, patchouli and sandalwood teamed with oriental spices has a real warmth to it and you feel as if you are being wrapped up in the softest cashmere scarf. Often I find warm and spicy fragrances slightly androgynous, however, the jasmine and patchouli keep it ultra feminine. 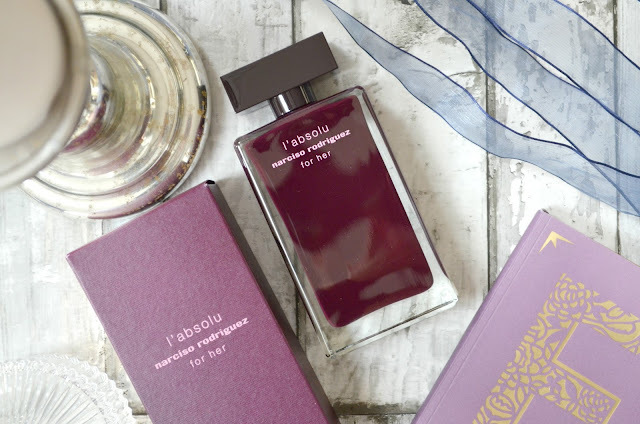 This is going to be worn a lot over the next few months by me - what autumn fragrances are on your lust list?